An umbrella company for compagnies and NGO's. How does it work? Declaration of employment, work contract, salary statement, declaration of social charges, medical visits, pensions, etc. The hiring company has no personnel management or contract management responsibilities; it is only invoiced for the service conducted. Select Services prepares the work contract for the consultant. The consultant can therefore undertake the work with advantages similar to self-employed workers, but with an employee status. We act as an employer to sub-contractors. 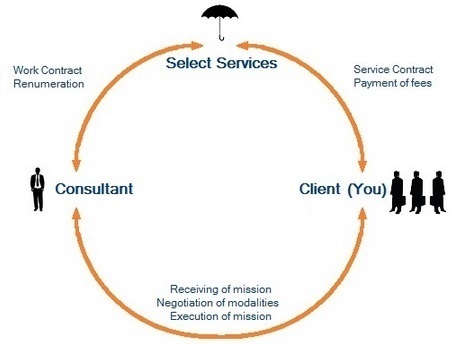 The consultant becomes, in effect, an employee of Select Services. Enjoy a transparent and balanced relationship between the company and the consultant.